I’ve recently started reading a fun new food blog called “The Pioneer Woman”. 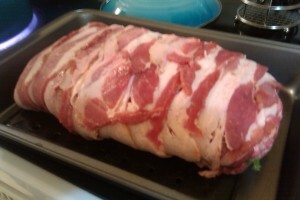 http://thepioneerwoman.com/ It is a fun blog. She writes well and takes great photos as she is cooking of all the various steps, which I love. A friend and I have come to believe that the woman must have at least two extra arms. I decided that I needed to try out some of the recipes on her site to see what the actual food was like. I decided on meatloaf. Why meatloaf? I’m generally not a big fan. It wasn’t something I had much as a kid because I was always worried about what might be hidden in it. But, I had a meatloaf sandwich the other day that was awesome, and this recipe looked good, so I thought I’d give meatloaf another shot. 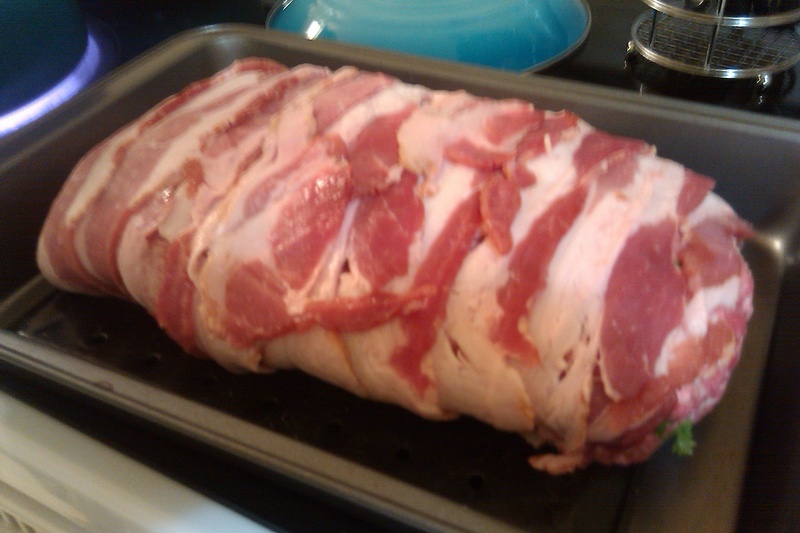 And, it’s covered in bacon, so that’s cool. Now, when I made this recipe, it was not a complete success. The cooking times that the Pioneer woman gave were way off. She said 15 min prep and 45 in the oven. Boy, was that off! It took me a solid 30 min prep and I cooked mine for an hour. Maybe her oven is way hotter than mine. Unfortunately, by this time it was much later in the evening than I expected and I was starving. So, I pulled it at that time. But, I think it needed at least an hour and a half. We ate it. The flavor was good and I think it had potential to be awesome, but it needed to be a little firmer and solid, which the extra time would have accomplished. So, give yourself at least 2.5 hours to cook this. Don’t start at 8PM like I did. Eating undercooked meatloaf at 11 is a bummer. But, I think this recipe has potential, so I’m not tossing it. However, unless you are feeding a crowd, you should half this. I ended up with so much leftover meatloaf, it was nuts. 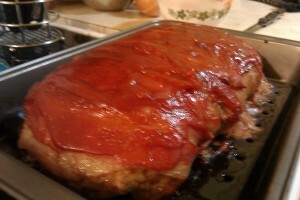 Bake for 45 minutes, then pour another 1/3 of the sauce over the top. Bake for another 15 minutes. (at least!!! Wait until you get a nice caramelizing brownness on the top and the meat is well done throughout.) Let rest. Slice and serve with remaining sauce. 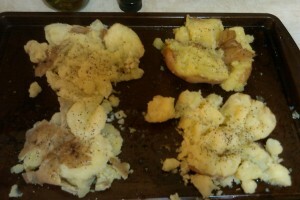 To go with the meatloaf, I also tried her recipe for crash hot potatoes. These are a win. Like the meatloaf, I didn’t get around to it until late in the evening, so I didn’t let them crisp up as much as I should have out of impatience, but this is a great way to do potatoes and I will be trying them again. 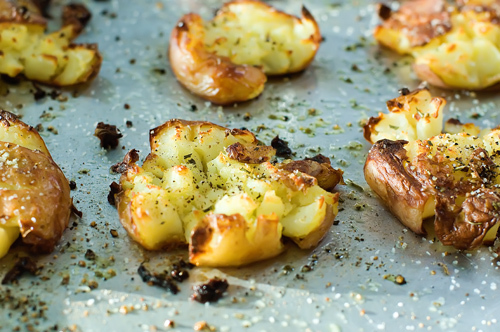 In her blog the Pioneer Woman said this about these: “They’re a lovely twist on the tired old baked potato, and they perfectly embody a quality I always strive to achieve in my cooking: Flavorful, Crispy Surface Area.” I also love crispy surface area, so decided to give these a try. You do it too, you’ll love it. Hiya very nice website!! Guy .. Beautiful .. Wonderful .. I’ll bookmark your blog and take the feeds also¡KI’m satisfied to find a lot of useful information here within the submit, we want work out extra strategies in this regard, thank you for sharing. . . . . .
It¡¦s truly a nice and useful piece of information. I¡¦m satisfied that you simply shared this useful info with us. Please stay us up to date like this. Thank you for sharing. Get you improved the place? It appears as if staying going faster than normal. Nice post however.